HERE once lived near the town of Vannes an orphan boy named Peronnik. When he was hungry he asked the farm women of the countryside for their broken bread. When he was thirsty he drank at springs, and when he was sleepy he sought out a haystack and curled himself within its shade. Peronnik was a happy lad, however, for whenever he had the wherewithal to ease his hunger he sang with a voice as sweet as an angel's, and thanked God for having given him so many blessings. One day Peronnik came to a farmhouse built on the edge of a forest, and as he was well-nigh famished he went to the door and asked for a crust of bread. The farmer's wife was scraping out the porridge pot with a flint, but when she heard Peronnik's voice she gave him the pot to finish. He sat down on the doorstep and putting the saucepan between his knees began to scrape away with a will. "This is oatmeal fit for a king," he exclaimed 'twixt ravenous mouthfuls. The farmer's wife was delighted at the praise of her porridge. "Poor lone boy," she said, "there is not much left, but I will give you some homemade bread." She brought the lad a small loaf fresh from the oven, and he bit into it like a wolf, declaring that it must have been kneaded by the baker of My Lord Bishop of Vannes. The peasant woman, bursting with pride to hear her bread so applauded, said it was much better with butter. And she brought Peronnik a pot of butter freshly churned. Peronnik spread it on the bread, declaring there was no butter like it in all the land of Brittany, and the dame was so delighted that she gave him a bit of last Sunday's bacon. The boy swallowed it as if it had been spring water, for it had been many a long day since he had been so bounteously fed. While Peronnik was enjoying himself thus a knight came riding by and asked the farmwife the way to the Castle of Kerglas. "Blessings on us! Can it be that you are going there?" asked the woman in astonishment. "Yes," replied the knight, "and to go to the Castle of Kerglas I have come from a country so far away that I have been travelling day and night for many moons." "And what do you seek at Kerglas?" the dame inquired. "I am seeking the golden basin and the diamond lance," the stranger answered. "Are they very valuable?" asked Peronnik, who had been listening with both ears. "They are worth more than all the kings' crowns in the world," replied the knight. 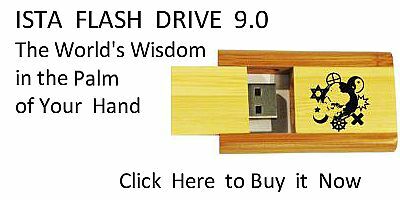 "For not only does the golden basin give you all the food you may desire, but if you drink from it you will be cured of any sickness. As for the diamond lance it will destroy all that it strikes." "And who has this basin of gold and this diamond lance?" asked Peronnik amazed. "They belong to a wizard named Rogéar. He is a giant who lives in the Castle of Kerglas," interrupted the farmer's wife who had heard of the wizard before. 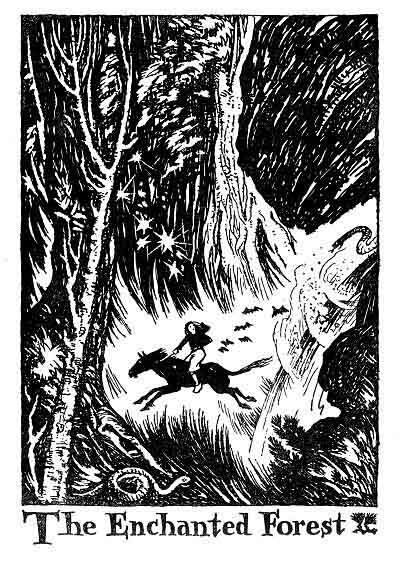 "You may oft see him ride near the edge of the forest," she continued. "He mounts a black mare who is followed by her foal. But no one dares attack the wizard for he carries the magic lance." "Yet I am told he does not bear it in the castle," said the knight. "Rogéar locks his lance and his basin in a dark keep beneath the ground. I plan to attack the wizard and win his magic treasures." "You will never succeed, good Sir Knight," said the farm woman. "More than a hundred noblemen have tried this adventure but not one has ever returned." "I know that full well, worthy dame," answered the knight, "but I have had instructions from the hermit of Polavet." "What did the hermit tell you?" asked Peronnik eagerly. "He warned me that I must pass through a wood where magic spells await me and where I may lose my way," the knight replied. "If I succeed in passing through the wood I shall meet an elf armed with a fiery dart. This elf is guarding an apple tree from which I must pick an apple." "And after that?" queried Peronnik. "I must find the flower that laughs," the knight continued. "It is guarded by a lion whose mane is formed of vipers. But I must pluck the flower. Then I shall have to cross the dragon's lake and fight the blackamoor. He is armed with an iron ball which always hits its mark and then returns to its master." "Is that all?" Peronnik asked. "No," answered the knight, "for finally I must go through the Valley of Delights where I shall see everything that can tempt and hold me back. Then when I pass the valley I shall come to a river with a single ford. There shall I find a lady draped in black. I must carry her across the river and she will tell me what next is to be done that I may gain my quest." undertake the venture. She felt assured no man successfully could undergo all these dire ordeals. "This is not a matter that a woman can judge," announced the strange knight haughtily, and after the entrance to the forest had been pointed out to him he spurred his horse and disappeared among the trees. The woman sighed, declaring that there would soon be another soul before the judgment Throne. Peronnik was about to go upon his way when the farmer arrived from the fields. He was in need of a cowherd and he had no sooner seen Peronnik than he decided to engage him. Peronnik was delighted to enter the farmer's service because of the good food he knew the farmer's wife would give him. So out to field on the edge of the forest went the boy to watch the cows and to bring them home at sunset. One day shortly after this as he was running to and fro among the cows Peronnik heard the sound of horses' hoofs, and looking toward the forest he saw the giant Rogéar riding his black mare followed by her foal. 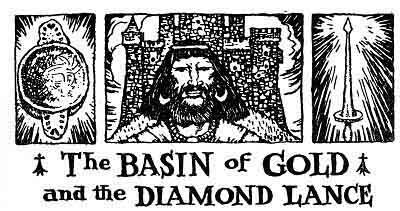 On a cord around the giant's neck hung the golden basin and in his hand he bore the diamond lance. Peronnik, frightened, hid behind a bush until the giant had passed by and had disappeared among the trees. to seeing him, ran to hiding no longer. Peronnik was thinking how much he himself wished to follow the adventure, of which the knight had told. "And what a glorious thing it would be," he mused, "to get possession of the golden basin and the diamond lance!" One afternoon when Peronnik was alone in the meadow watching the cattle he saw a man with a flowing beard standing at the edge of the forest. Peronnik wondered whether he were a stranger come as had the knight to seek his fortune, so approaching the bearded figure he asked him if he were looking for the road to the Castle of Kerglas. "No, I am not looking for it," answered the stranger through his beard, "for I already know it." "You have been to Kerglas and the giant did not kill you!" exclaimed Peronnik. "Rogéar has nothing to fear from me," the white-bearded man replied. "I am the sorcerer Bryak, Rogéar's elder brother. When I wish to see him I come here, and as I cannot go through the enchanted wood without being lost, in spite of my magic power, I call the black colt to show me the way." The little horse appeared at once. Bryak put a bridle on him, swung upon his back and disappeared into the forest. Peronnik said nothing of this to anyone, but now he understood the first thing necessary to get to the Castle of Kerglas was to ride the colt who knew the way. The boy did not know how to draw the magic circles, nor how to say the magic words, but he did remember the verse to call the colt. Nor yet knew he the proper way to gather the apple, to pluck the flower that laughs, to escape from the blackamoor's ball, or to go through the Valley of Delights. Peronnik decided to make a bridle of flax, a snare to catch snipe which he dipped in holy water, and a linen bag which he filled with glue and larks' feathers. Then he took his rosary, a wooden whistle, and a bit of bread rubbed with rancid bacon. With these things Peronnik was ready to begin the adventure. then stopped and ate the crumbs and thus was soon left alone, as the giant on horseback passed quickly on among the trees. The foal stopped, turned, and quickly came to Peronnik, who gently bridled him. The lad then jumped upon his back and gave the colt his head, for he was sure the colt knew the way to Kerglas. And indeed the colt without the slightest hesitation took one of the wildest paths into the forest and trotted quickly into its gloomy depths. The ride was terrible to Peronnik and he trembled with fear. The forest was enchanted. and spells were cast to terrify him. The trees appeared to be in flames; they loomed appallingly, like specters of some nether world; the streams became enraged torrents., and overhanging rocks seemed threatening to topple. Peronnik pulled his cap over his eyes so he could not see what dread shapes surrounded him, and the colt bounded ever forward. spells were ended. Peronnik now dared to look about him. It was a desolate spot and here and there were skeletons of nobles who had come to seek the Castle of Kerglas. Peronnik, shuddering, passed quickly onward and came at length to a meadow which was shaded by a mighty apple tree that groaned beneath its load of fruit. Near the tree stood an elf and in his hand was the fiery dart that turns all that it may touch to ashes. "Do not bother about me, little prince, I am going through the meadow only to reach Kerglas." "And who are you?" demanded the elf, lowering his arm. "I am Peronnik, you know," answered the boy. "I know nothing of the kind," retorted the elf. "I pray you to not let me waste my time," said Peronnik. "I have the wizard's colt and I must take it on to Kerglas." The elf seeing that he indeed did have the colt was about to let him pass when he noticed the snare Peronnik was carrying. "For what is that?" asked he. "That is to catch birds," Peronnik replied. "No thing that flies can escape its meshes." "I should like to be assured of that," said the elf. "My apple tree is plundered by the blackbirds. Get your snare ready and if you catch a blackbird I will agree to let you pass." Peronnik accepted the proposal. He tied the colt to a branch, then went to the trunk of the tree, fixed one end of the snare to it and asked the elf to hold the other end while he prepared the pegs. The elf did so. Then Peronnik deftly tightened the slipknot, and in a trice the dwarf found himself captured in the snare. The elf uttered a howl of rage and fought to free himself, but the cord which had been dipped in holy water held ever tightly. Peronnik then picked an apple from the tree, mounted once more upon the back of the foal and rode off while the elf still raged within the captive meshes. Peronnik soon left the plain behind him and came to a lovely glade where grew sweet shrubs and plants of every known delicious fragrance. In the midst of all, there nodded the mysterious laughing flower. But a lion was guarding this glade. He had a mane of vipers, and his growl resounded like the rumblings of thunder. Woe to that adventurer who fell within his claws! Peronnik took off his cap to the lion and wished him good luck, and then asked if this were the right road to Kerglas. "And what business have you at Kerglas?" roared the lion, fire flashing from his eyes. "I am returning the wizard's colt, do you not see?" Peronnik asked in return. Well, yes, the lion did see it. "But before I let you pass, reveal the contents of your bag," commanded the mighty beast approaching Peronnik and sniffing the sack which held the feathers and the glue. "I shall be glad to," said the boy, "but beware, for what is in it might fly out." "Birds! Open it a little then, and let me look in," growled the beast who by now had become very curious indeed. That was just what Peronnik wanted, so he held out the bag half opened and the lion plunged in his head. Of course the feathers and the glue stuck to him. Peronnik quickly pulled the string and fastened it tightly around the lion's neck. Then he rushed toward the laughing flower, plucked it and rode off as swiftly as the colt could carry him. Riding thus it did not take long to reach the lake of the twelve dragons. Across this the lad had to swim upon the colt, and hardly had they touched the water than the dragons came crowding to devour him. and died. Thus Peronnik and the colt swam safely to the far side of the lake. But Peronnik had yet to enter the valley watched over by the blackamoor, and before long he beheld this evil man in the narrow entrance to the valley. He was chained to a rock by one foot and he had in his hand the iron ball which always hit that at which it was thrown and then returned to its master. This blackamoor had six eyes around his head and each eye took its turn awatching while the others slept. At this moment all six eyes were open. Peronnik knew that if the blackamoor saw him he would hurl the iron ball and it would crush him. So Peronnik dodged among the woods, and in this way managed to get quite close to the blackamoor who had just sat down to rest and had closed two of his eyes. Encouraged by this Peronnik began to sing in his soft and musical voice and the blackamoor shut his third and fourth eyes. Peronnik sang on and the Blackamoor slowly closed his fifth eye. The lad then began to chant the vespers and before he had finished the blackamoor was fast asleep. The lad now took the colt by the bridle and led him noiselessly over the grass-grown road. He passed the blackamoor without a sound and entered at length the Valley of Delight. instead of water, the flowers sang and the trees reached down their branches and offered their bounteous harvest. Peronnik saw tables spread as for a king. He smelled the delicious odor of fresh cakes and other good things. Servants waited for his commands. Beautiful maidens danced upon the flower-spangled lawns. They called to him by name and invited him to join the revelry. Peronnik had all but alighted from the colt and at once all would have been over with him when suddenly the memory of the golden basin and the diamond lance bade him pause. He straightway pulled out his wooden whistle and began to pipe upon it so as not to hear the sweet voices of the maidens. And he ate his bread and rancid bacon and he no longer smelled the enticing spread upon the tables. He fixed his eyes on the colt's ears and so could not see the lovely dancers. In this way he proceeded through the valley without any mishap and at last in the distance beheld the Castle of Kerglas. But he was cut off from it by the river with one ford. The colt knew well the ford and going directly to it strode out into the water. Then Peronnik looked about him to find the lady who was to take him to the castle, and there she was seated on a rock. She was dressed in black satin and her face was as dark as the shadows of night. Peronnik pulled in the colt, and taking off his cap, bowed to the lady. "I have been waiting for you," she said. "Will you tell me what next to do?" Peronnik asked. "Yes," replied the dark lady, "if you will take me across the river." Peronnik helped her to mount behind him, then continued to ford the river. "Listen," said she of the satin dress. "The apple tree which was guarded by the elf is a magic tree, and if you can persuade the giant Rogéar to eat the apple which you have brought you may win the golden basin and the diamond lance." "I shall try," said Peronnik, "and if I succeed how can I obtain the basin and the lance? Are they not hidden in a dark underground chamber which no key can open?" "The flower that laughs," answered she of the dark countenance, "opens every door and lights the darkest places." "By all the magic powers! That is my colt the young scapegrace is riding!" "Yes, it is, greatest of all magicians," said Peronnik, bowing and taking off his cap. "And how did you lay hands on it?" the giant Rogéar roared. "I repeated what I learned from the sorcerer Bryak, your brother," returned Peronnik. "Humph! And what do you want?" demanded the giant. "I have brought you two rare gifts from your brother Bryak," Peronnik said, "this dark lady for a serving maid, and this magic apple which will make glad your heart." "So be it, then, give me the apple," said the giant, "and help the lady to dismount." laughing flower. He passed through fifty rooms and one and came at last to a silver door. This room led to the underground chamber. The door was locked with a ponderous lock, but yielding to the laughing flower it swung open. Peronnik still holding the flower before him entered and beheld awaiting him the golden basin and the diamond lance. Hardly had Peronnik seized them than the earth began to quake. Thunder rolled and lightning flared, and suddenly the castle vanished and Peronnik found himself at home once more in the field among the cows. But in his hands he clasped the golden basin and the diamond lance. Carrying these treasures that he had at last won from the Castle of Kerglas, Peronnik set out for the court of the King of Brittany. When he came to the city of Nantes he found it besieged by the French. The French soldiers had so devastated the country around about that there was nothing left but shrubs for the goats to nibble. The people were starving and the soldiers of Brittany who had not died of wounds were dying of hunger. Now the very day that Peronnik reached Nantes a herald was proclaiming that the King of Brittany would adopt as his heir the man who would deliver the city from the French. "Read your proclamation no more. Take me to the king for I am he whom he seeks." So when Peronnik came before the king he showed the magic basin and the diamond lance. The king was delighted and promised according to his proclamations to make Peronnik his heir if the lad could free Nantes from the besiegers. And the king fulfilled his word. For Peronnik by means of the diamond lance quickly swept Brittany of all its enemies. And with the golden basin he restored the wounded Breton soldiers. It is said that Peronnik went to the Crusades and married a princess of the Saracens. They had many children, to each of whom he gave a kingdom. But others say that the wizard's brother Bryak succeeded in winning back the golden basin and the diamond lance, and that no one now can ever find them no matter where he seeks.